Don't pay attention to my chippy nail polish! UGH! Saturday morning we had a little breakfast date at Market Street. I have no clue why I love their breakfast as much as I do, but I do! I'm a big fan of their breakfast burritos. Anyway, I slept in (well until 7:00), had a burrito, and then finished it off with a yummy coffee. Then we picked up the hooligans from the grandparents. They had the best time! A new furniture store, Nebraska Furniture Mart, opened a month ago close to us. We decided to fight the Memorial Day weekend crowd and check it out. 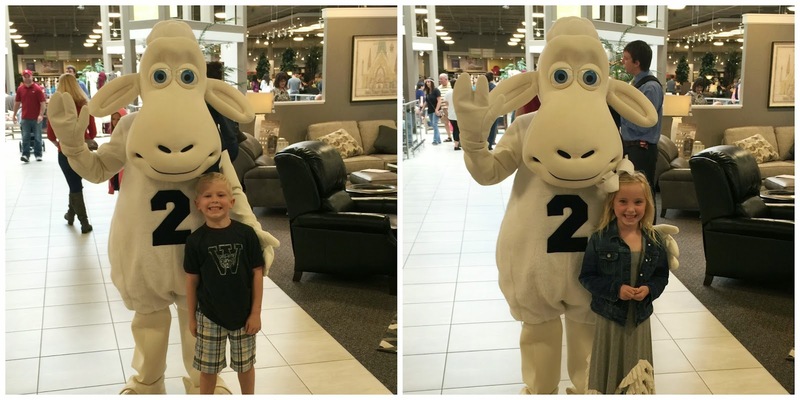 Do you know what you do when you see the Sleep Number Sheep walking around?? You ask to take a picture with him. A selfie before church in our red, white, and blue for Memorial Day. Super blurry-but someone else wanted in on the fun! We cooked out with friends Sunday night and enjoyed a nice low key CRAZY rainy Memorial Day. On Tuesday the boys and I had lots of groceries to get after the gym. I asked them if they wanted to grab a bite before we shopped. Nixon asked for biscuits, gravy, and sausage. Bowen asked for spaghetti at 10:15 a.m. haha! Yesterday, Tab took Nixon to the Byron Nelson golf tournament. The golfer behind him is Jordan Spieth. Apparently Nixon said loudly, "Dad, that's his driver", while he was about to hit/swing (don't know the technical golf term). Jordan heard him looked over, laughed, and had to start his little routine all over again. Isn't so sad that we now consider sleeping in sleeping until 7!!! Grandparents are the best!! My parents take our little guy every two weeks so the hubs and I can have a date night, I am so thankful every time! Love the story of Nixon at the golf tournament:) So cute! Girl, I love that the way to both of our hearts is a breakfast burrito :). And that last pic of Nixon just melts my heart! So I've never had a Market Street breakfast burrito. I will change that VERY soon. Well good thing it wasn't Tiger Woods...heard he's not so nice when that happens. That's really funny though. And I can't believe I haven't had a breakfast burrito at MS before. I'll have to try one now. Breakfast is my favorite! Jordan Spieth the Master's winner for this year?! Lucky kiddo!!! I could really go for a breakfast burrito or biscuits and gravy now! Ha! What kind of eyeshaddow do you use? I love it! Dont know golf but that story was super cute! Love that Jordan Speith was so sweet about the interruption.